Posted: Thursday, June 18, 2015. 7:49 am CST. Thursday, June 18th, 2015. 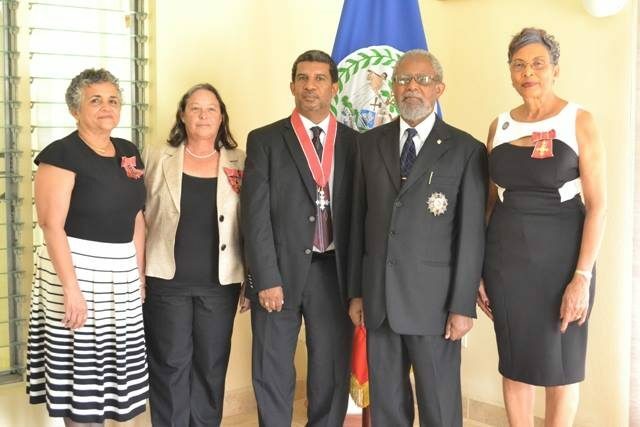 BMG: On behalf of her Majesty, Queen Elizabeth II, Governor General Sir Colville Young, bestowed honors of the Most Excellent Order of the British Empire to four outstanding Belizeans. The recipients were: attorney Michael Young, who received the order of Ordinary Commander for his contribution to the legal profession and the community; Esther Ayuso, who received the order of Ordinary Officer for her contribution to community and women’s rights; Laura Tucker-Longsworth, who received the order of Ordinary Officer for her contribution to nursing and the community; and Bernadette Fernandez, who received the order of Ordinary Member for her contribution to leadership and community. The staff at Belize Media Group wishes to extend a proud and heartfelt ‘Congratulations!! !’ to these outstanding citizens. Photo courtesy of Belize Press Office.